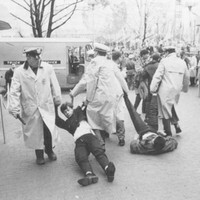 This is a photo of Columbia CORE members Joe Drew (back) and Paul Nyden (front) demonstrating at the 1964 World's Fair. Both were arrested after the photo was taken. 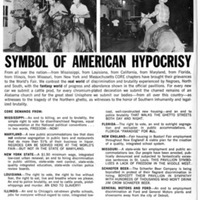 Nyden was chapter chairman at the time. This is a poster for the 1964 World's Fair Stall-IN. 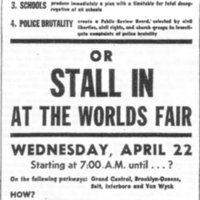 This is a short film clip of Malcolm X speaking in favor of the Stall-In initiated by Brooklyn, Bronx and Harlem CORE. He is interviewed by NBC News. 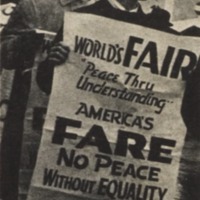 This is a poster national CORE used to promote its demonstration at the opening day of the 1964 World's Fair. 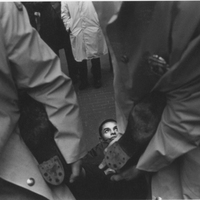 This is a photo of a demonstrator at CORE's protest at the 1964 World's Fair. The demonstrator is unknown at this time. This is one of the most well known photos of CORE's demonstration on the opening day at the 1964 World's Fair. The protester being carried out is unknown at this time.